Located in Yosemite Valley, Yosemite Valley Lodge (formerly Yosemite Lodge) offers private rooms with extraordinary views of all the major sights in Yosemite including: Sentinel Rock, Half Dome, Yosemite Fall and El Capitan. 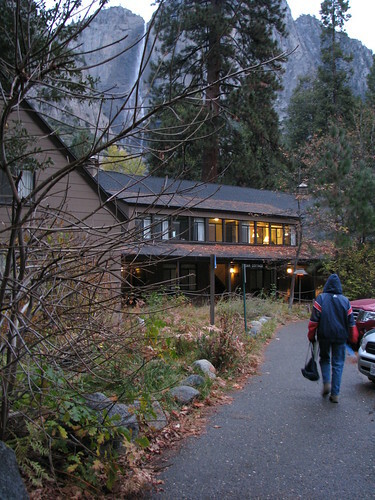 Yosemite Valley Lodge is located directly across Northside Drive from Yosemite Falls and offers 226 lodge rooms, 19 standard rooms and 4 family rooms. Yosemite Lodge offers cafeteria style dining, steak house fare in the Mountain Room restaurant and cocktails in the Mountain Room Lounge. Our stays at Yosemite Lodge have been nothing but excellent, over the many times that we’ve stayed there. A few times…many years ago, the desk folks didn’t have it all together it seemed, but other than that, the rooms have been excellent; the lodge is close to everything in the valley; and, the transportation is easy to get in front of the lodge area, so…Yosemite Lodge is a great place to stay. When we were raising our two girls…many years ago, we used to stay at the various camps and then went into housekeeping, and eventually to the little cabins at Camp Curry. Eventually, we graduated to Yosemite Lodge and have never looked back. We highly recommend the lodge! We are going to try a rental, up by Wawona this next spring, just to see what it’s like–Away from the many tourists, some of whom have little respect for others, that come in on buses and usually are wearing white face masks for colds, etc., etc. And, of course, how long it will take us to get down into the valley, compared to being right at the valley and within such close proximity to all the sites. Note: Yosemite Valley Lodge does not have air conditioning in any guest accommodations. Have you stayed at the Yosemite Valley Lodge? We’d like to hear from you. What did you like? What did you not like? What was your overall opinion? Send you emails to info@yosemiteblog.com. Photo by tomsaint11 via Flickr.